Koh Tao means Turtle Island in Thai. A small island, which is a 90 minute boat ride north of Koh Samui, offers the best dive sites in the Gulf of Thailand. With clear waters and stunning bays, the underwater world is right on your doorstep. The island also boasts a vibrant nightlife with many bars, restaurants and parties. 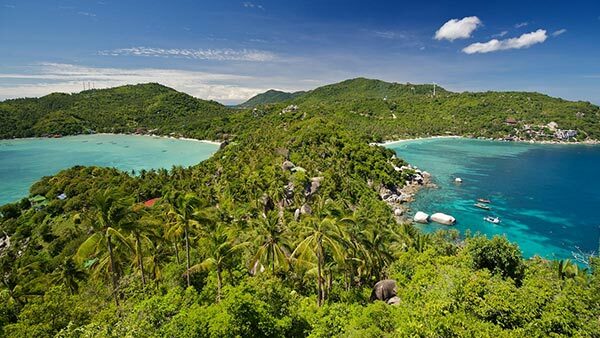 Koh Tao has a tropical climate and is hot and sunny with occasional heavy rainfall during monsoon season. We are a tiny island in the middle of the ocean and it is therefore difficult to predict the weather accurately. We get the occasional rainfall in hot season and really sunny days in the middle of monsoon. It is nature and we work with it. Diving still takes place unless it is unsafe to take our dive boat out. Our little tropical paradise island is mainly known for diving. There are over 20 dive sites around the island teeming with marine life and coral species. You can hire bicycles, motorbikes, jeeps & taxi boats to travel around the island and to explore the many beaches. Among the many souvenir shops, you’ll find banks, ATM machines, a post office and small supermarkets. For any medical problems, there are several clinics staffed with professional personnel, including doctors. When it comes to food and drink, you’re spoilt for choice. In recent years, the island has experienced an explosion of restaurants, bars and nightclubs. There are now 3 villages on the island – Sairee, Mae Haad, and Chalok. Sairee Village is the largest town and is just a 5 minute walk from the resort. Here you can find anything from cheap, delicious, street food to top-end restaurants.